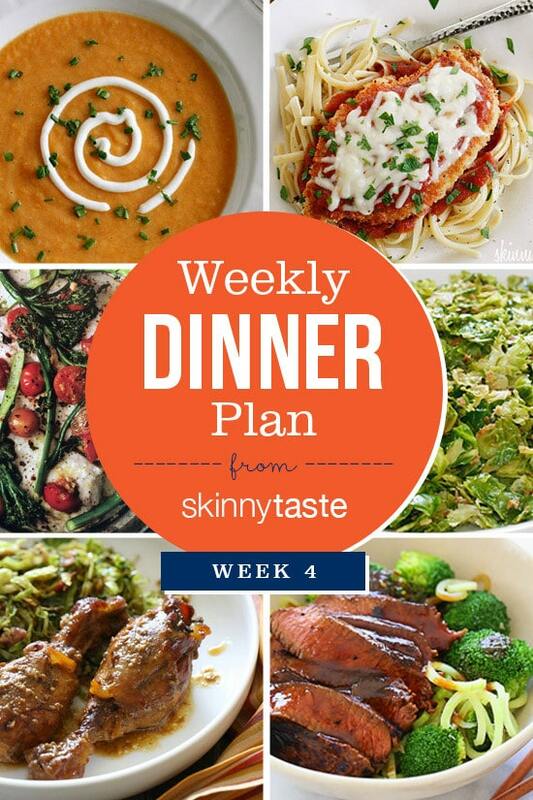 I’ve gotten such great feedback since launching The Skinnytaste Meal Planner and sharing a sample of my weekly dinner plan for the week, this is now going to be a Sunday ritual. I do all my food shopping on Sundays, but you can do what works best for you. This is week four, while planning I realized I will be away a few days (on a photo shoot for my new cookbook! ), so I am making some of the meals ahead for my family or keeping it really simple for them to make without me. We are a family of four, so leftovers usually get packed for lunch. My weekday breakfast is simple, usually a smoothie, avocado toast or hard boiled eggs and fruit. Weekends I get more creative as I am feeding the family. Just got your cookbooks, love them. One thing that would help, I am making Easy Broccolini Flounder Bake this week, at just 166 calories a serving, what would you add to this for a complete meal, a healthy carb? A salad? Or do you just leave that up to the reader? I understand the principal of 1/2 plate fruit and veggies, 1/4 good carb, 1/4 protein…so I am capable of adding to it, just wondered what you would add. I need to beef this up for my husband. Also, 166 calories won’t make a full meal for me either. I know sometimes you do put what you would serve with the recipe, I would find that helpful each time….in case you were wondering ???? Thnaks for sharing and cooking and experimenting for thousands of people you may never meet but who appreciate it! We love making this with brown rice or farro as a side. I always make salad with dinner too. Hope that helps! Yes, thanks! Sorry for all the typos above, that is what I get for replying on New Year’s morning without my glasses on! Happy New Year! I love these meal plans, they help my planning so much!! Making the Maple drumsticks for Sunday night dinner! I love the meal plan posts! What's been your average grocery bills using your meal plans? I absolutely love your meal planing!! Thanks from a full-time intern and full-time college student! 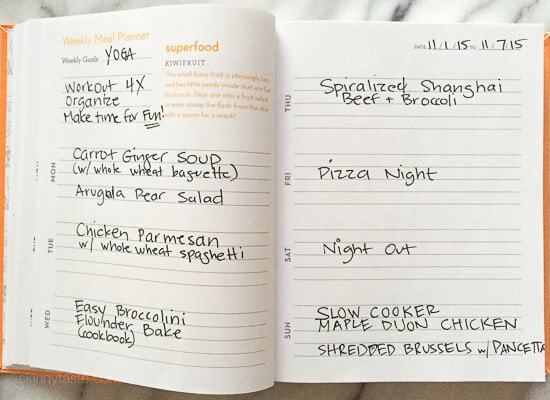 I am really loving the weekly dinner plan! It is giving me a lot of great ideas as I am trying to change the way my family & I eat & meal planning is something I struggle with. Is this something you will be able to continue doing for a while? I always love your weekly meal plans. It gives me great ideas for my week! I know you mentioned making things in advance – but how long do you typically make a meal in advance? I worry a lot about how long things will keep and I am curious on your thoughts on the matter. It depends on the dish, the ones that are freezer friendly can be made ahead and frozen for the month, others would be ok 1 to 2 nights in the fridge. I've been making a weekly menu for a few years. It's interesting to see what you plan for the week. This week I have two of your recipes on the menu. Shaved Brussels sprouts and Sofrito chicken. I haven't tried either of them yet but I haven't made any of your recipes that we didn't like yet. Love that idea Nancy, so happy you enjoyed the chicken Parmesan!